San Francisco's politicians have been working hard to make nice with Airbnb. They even let Airbnb's lobbyists make the city's "home sharing" regulations more liberal, allowing homeowners to host with Airbnb without obtaining an expensive bed and breakfast permit. But now that the proposed rules have been amended by the city's Planning Department, the company is staging protests against them. 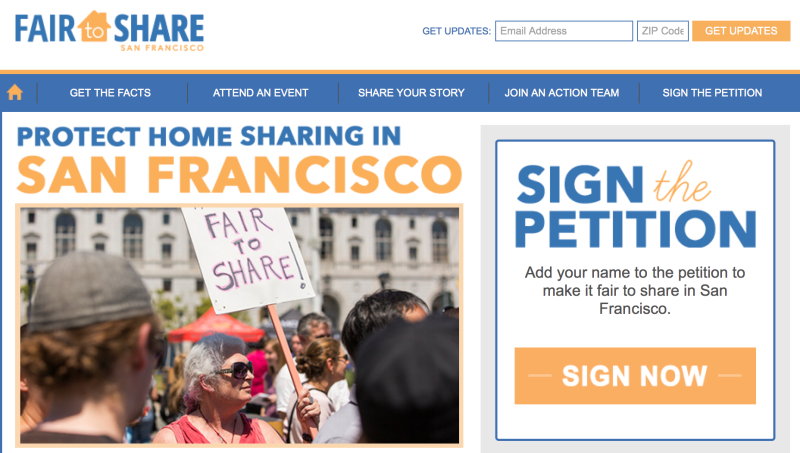 The recent effort to sway the legislation comes from Fair to Share, an "online resource and action center for the thousands of San Franciscans who believe that you should be allowed to share your home." Fair to Share advertises itself as a coalition of "groups of home sharers in local neighborhoods" that "take action in support of home sharing." What they don't explicitly tell you is that the lobbying platform is owned by Airbnb, and it's being used to push the city's legislation to be even more favorable towards the company. Fair to Share launched last week with a media rally attended by "two dozen Airbnb hosts" in the backyard of a Bernal Heights rental. At the kick-off rally, members of Fair to Share complained about the proposed creation of a public database of Airbnb hosts, the San Francisco Chronicle reports. They also want the 90 days per-year limit on short-term rentals extended to 180 days. The brochures for Fair to Share San Francisco laid out on tables at the house were also paid for by Airbnb, said Peter Kwan, who heads Home Shares of San Francisco, one of the groups in the coalition. Even the P.A. system, said its operator, was paid for by Airbnb. And once most of the hosts had left, four Airbnb employees cleaned up from the event. Airbnb has tried this trick before. Last year, the company helped launch Peers, a "member-driven organization" that lobbies on behalf of sharing economy startups—particularly against New York City's actions against Airbnb. But whereas Peers attempts to mask its deep connections to Airbnb, Fair to Share acknowledges that it is owned by the $10 billion company. 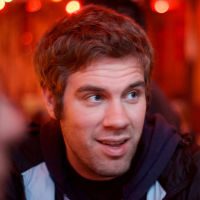 The organization's domain, fairtoshare.org, is publicly registered to "Airbnb, Inc." And the group's Terms of Service states that Airbnb (and its foreign tax shelter) manages the website. Airbnb operates the Airbnb Community Services, which seeks to provide advocacy opportunities dedicated to advancing your right to share your home or to share the home of others. What Airbnb doesn't explain is why it is staging protests against the friendly legislation it has been secretly co-authoring since at least January, 2013—or why the company's demands have changed. According to emails obtained by the San Francisco Bay Guardian, an Airbnb lobbyist pushed San Francisco Supervisor David Chiu's legislative aides to change the legislation, allowing hosts to rent their homes for up to 120 days per-year. But now Fair to Share's "members" are lobbying for an 180 day allowance. In a statement to the Examiner, Airbnb spokesperson Nick Papas said "the company is proud of its part in the campaign" and home sharing is "making The City a better place to live."